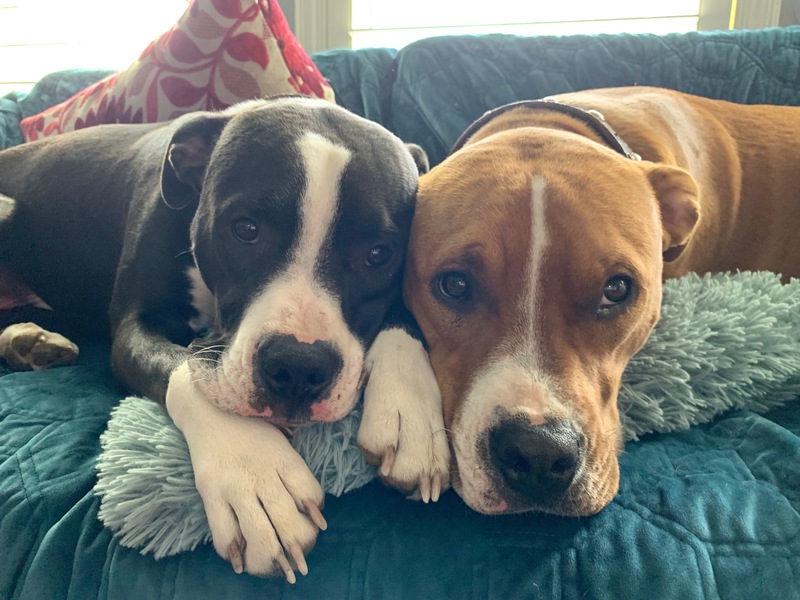 For this Omaha dog training session we shared tips to stop resource guarding to help 11 month Staffordshire Terrier / American Bulldog mix Sam stop stealing then guarding toys from her brother Jack. The siblings live with two other dogs, puppies actually. We hope to see the puppies in our Puppy Socialization classes soon; one of them is at a very young and impressionable age and the second was fearful around new people. Because a puppy doesn’t get its true personality until its 9 months, the sooner the guardians can enroll the pups, the better. To address Sam and Jack’s dog behavior problems, we first discussed exercise, rules and structure. As Omaha’s dog behavior expert, I have found that a lack of rules, structure and exercise are contributing factors for the vast majority of dog problems, including these dogs. One of the problems was Sams habit of trying to steal and horde all of the bones in the house. She thought this was a case of resource guarding so I handed her my phone so I could share tips to stop any dog from resource guarding. Sam obviously didn’t show any resource guarding behavior in the video, but its not unusual for some dogs to resource guard inconsistently. However while discussing things with the guardian, i’m not so sure this wasn’t simply a case of sibling rivalry and confusion where the dogs thought they had the same rank as their guardians. If that is the case, increasing exercise, interrupting play that gets too spirited, enforcing rules consistently, petting with a purpose and recognizing / rewarding desired behaviors through petting with a purpose will be the solution to that dog problem. If it is indeed a case of resource guarding, the positive dog training approach outlined above is a very effective way to stop resource guarding in dogs. To make sure the guardian can remember all the dog behavior tips I shared in this in home dog training session, we shot a roadmap to success video that you can watch below.